The anniversary of the industrial giant’s birth will be celebrated with great fanfare around the world and especially in Dearborn where Henry Ford Day has been proclaimed throughout the state of Michigan. In our nation’s capitol, commemorative cupcakes were served free to people downtown and on Capitol Hill Monday afternoon. So revered is the pioneering automaker that today is only the beginning of a full year of commemorative celebrations around the world he had so much impact upon. In Japan, 21 Ford dealerships have instituted Heritage Month, with showrooms turned museum exhibits, extolling the impact the brand’s namesake had on the industrial world. In Germany, Ford is acknowledging the anniversary with five road rallies celebrating the brand's automotive breakthroughs during its 110-year history. Even in far-off Romania, over 4,000 people turned out for events held by Ford in commemoration of their namesake. In the UK, celebrations of Ford’s heritage culminated in the unveiling of a new statue of Ford at the corporate Tech Centre there. Over coming months, additional celebrations will be marked throughout the Western Hemisphere as well as Europe. Ford’s Contributions to the World Henry Ford's conversion of the automobile to a mass-produced product transformed the agricultural economies of the US into a prosperous industrial society. Many credit Ford with virtually creating the middle class in America, singlehandedly. By doubling his workers wages to stop the turnover contrary to the higher skills demanded on the assembly line he set a precedent for distribution of company wealth impacting later management practices. It was a struggle to get Ford Motor Company on solid financial footing, but Henry Ford ended all that with the Model T.
The iconic vehicle debuted in October 1908, thus heralding the dawn of the Automotive Age. More than 15 million Model T's were built and sold as America first fell in love with the automobile. At one point in Ford’s early history, half the cars in America were Model T’s, selling for as little as $300 – and you could have any color – as long as it was black. A new car today, at any one of the almost 18,000 dealerships in the country, is likely to cost around $26,000. Henry Ford’s Other Innovations The moving assembly line was introduced by Henry Ford in 1913., reducing the time needed to build a Model T from 12.5 to 1.5 man-hours, ushering in the modern auto industry. 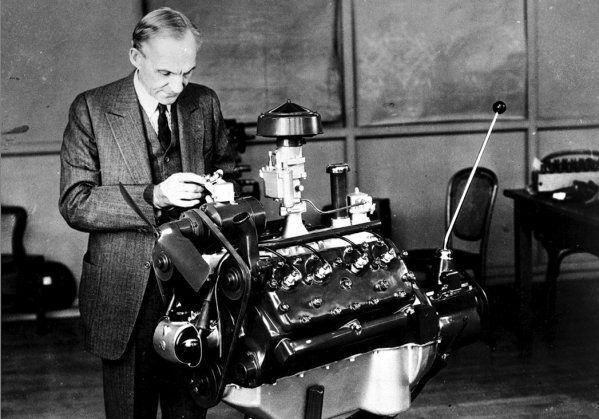 The principle of Vertical Integration – to insure quality, Henry Ford sought to own, operate and coordinate all resources required to fabricate automobiles. This principle was put into practice in 1927 with the Model A. "What my great-grandfather established, especially his legacy of innovation, continues to inspire our commitment to a strong business, great products and a better world," said Ford Executive Chairman Bill Ford. "We are putting unexpected levels of technology within reach of millions of people, accelerating the development of new products that customers want and value, and driving growth by creating jobs and bringing the freedom of mobility to the world." Spirit of Innovation Today The spirit of innovation Henry Ford engendered still guides the automakers approach to the industry, as demonstrated by a diverse vehicle portfolio, from the Fusion Hybrid spirited Mustang to the best selling F-150 pickup. It lives on in the fuel-efficient EcoBoost engines and resounds through the lives of employees on six continents. Henry Ford went up to that big flivver in the sky on April 7, 1947, at the age of 83. Over 50 years later in 1999, Forbes magazine named him Businessman of the Century, and in 2012 the History Channel documented his career in The Men Who Built America. "My great-grandfather's vision was to improve people's lives by making cars affordable for the average family," said Bill Ford. "His vision to build cars that are reasonably priced, reliable and efficient still resonates and defines our vision today." Our headline is from Aldous Huxley’s Brave New Word, of course – an admonition the world is unfolding as it should. Henry Ford would probably think so, but we can only wonder what he would think of Elon Musk and Tesla Motors. After all, Bill Gates and Steve Jobs didn’t get along all that well, did they?